Best School Holiday LEGO® Fun!! 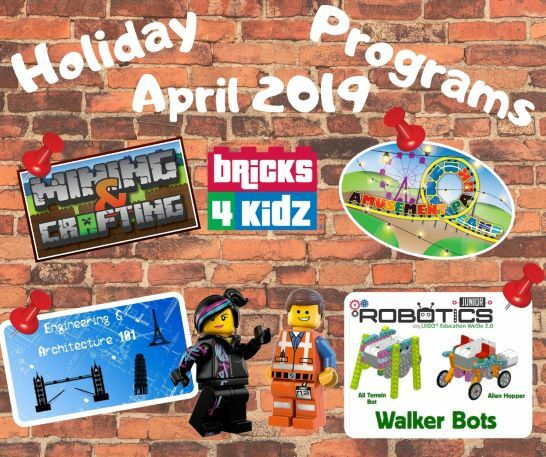 These school Holidays our workshops are inspired by the NEW LEGO® Movie, Wonder Park Movie, Minecraft®, Super Mario®, Brick Architecture & Engineering, JUNIOR ROBOTICS WALKER BOTS, and launching our NEW PROGRAM “JUNIOR BUILDERS” for 2 – 5year olds. Click on your preferred location below! BRICKS 4 KIDZ® is a Child Safe Child Friendly organisation and our number one priority in any activity is the safety of children under our supervision. Our trained Instructors and AWESOME program will keep the children engaged throughout the day. Children will be inspired to let their imagination and creativity run wild! With our own in-house BRICKS 4 KIDZ® models designed by engineers and architects and plenty of time for creative play with LEGO®, the kids are always having fun at our workshops! Our school holiday programs are designed for kids ages 5 – 12 and are staffed by trained, screened BRICKS 4 KIDZ® instructors. Our workshops are SUPER popular and may book out day’s before the workshop. We recommend to book your child in advance to save disappointment! We look forward to seeing you all soon! Common questions about our workshops. Do my kids get to take the LEGO Home? Children don’t get to take the lego home, However all children that attend the workshops on the day will receive a custom mini figure! Please note that food is not provided. Please provide a nut-free snack for your child to enjoy during the workshop. If staying for the full day children will need to bring their own nut-free lunch, morning and afternoon snack and a drink. Please make sure your child wears covered shoes, sunscreen and brings a hat! We will supervise them outside at breaks. Children are welcome at our workshops from as young as five, however all kids attending must be in prep in primary school at least in order to attend. Each workshop has a guide to suitable ages for the specific workshop, with some workshops more suited to older or younger kids. If in doubt please give us a call to discuss. What does a workshop at Bricks 4 Kidz look like? During the session, kids are broken up into different groups and rotate between a series of stations. These are structured with a particular time allocated at each one and all have different LEGO® activities on them. There is an instructor at all these stations. We also have time for creative play with our mountains of LEGO®, where kids can decide what they would like to build and use their imagination! How many children are likely to attend? How many staff will there be? Our staff ratios are 1 staff for every 8 kids minimum. For a full workshop we will provide 3 staff to supervise the kids. While activities in BRICKS 4 KIDZ® workshops with LEGO® Bricks are very safe, we place a very high focus on child welfare – at least one staff member at every one of our activities will have a valid First Aid certificate! All staff are working with children checked. What time can I drop off / pick up? We do not offer care before or after the workshops. Doors will open from 8.45am for children to be dropped off. Parents are welcome to come in 30 minutes before the finish to see what their child is building. We ask that all children are picked up promptly at the completion of the workshop. We offer discounts for people who book in our earlybird period. To get on our earlybird mailing list subscribe to our newsletter. If your child is visibly sick or carrying a high temperature on the day of the class, please keep your child at home! We will make up the workshop at the next opportunity. • Cancellations made at least THREE weeks from the start date of the school holiday workshop will receive an 80% refund. • Cancellations made TWO to THREE weeks from the start date of the workshop will receive a 50% refund. • There are no refunds for workshops cancelled LESS than TWO weeks prior to the scheduled date of the workshop. Does the program qualify for the Childcare Rebate? We are not able to offer a child care rebate. Many of our staff are teachers and university students (studying teaching), and some have early childhood or teachers aide qualifications. They have good knowledge and experience working with children and are equipped to work and interact with primary-aged children. We also have a ratio of never more than eight kids to each instructor, which allows the day to be a really fun day for all involved. Redland Bay School Holiday Workshops! “My 7 and 9 year old just attended their second holiday event with Bricks 4 kidz, and they loved it again. Loads to do, really creative, very well organised and great for the little one’s fine motor skills (but don’t tell him that). Highly recommended; this has become a regular holiday treat for us”. “Thanks Melina and team for a great session. My kids loved it. Beautiful setting, great fun and well catered for mixed ages. We always offer an Early Bird preview to families on our mailing list before each holiday program! Please join our mailing list on the Contact Us page to get early notice when spots are available. If your child has been to one of our workshops before, you are already on our list.